The clinical characterisation and description of the obstructive sleep apnoea–hypopnoea syndrome (OSAHS) and related syndromes were mainly revealed by several epidemiological studies conducted over the past fifty years. These highly prevalent syndromes affect about 9% of middle-aged men and 4% of women. These syndromes have serious medical and social consequences, such as cardiovascular or metabolic diseases, and even premature death. Consequently, respiratory sleep medicine (RSM) evolved and has progressed rapidly within the sleep medicine field over recent decades. New diagnostic and therapeutic techniques have appeared in response to an increasing number of patients and clinical interventions. The research progressed to focus not only on the clinical and pathophysiological but also the genetic and molecular aspects of these syndromes [1–6]. Nevertheless, the literature in the field does not provide any clear consensus on diagnostic classification and assessment. No harmonised standards of training exist across Europe for respiratory sleep medicine. The European Respiratory Society (ERS) provided external and postgraduate courses but the requirements and expectations in the field were not being fulfilled. There was a need for a project supporting both the teaching and certification. For this reason, ERS supported an application for a Sleep Harmonised Education in Respiratory Medicine for European Specialists (HERMES) Task Force project which aimed at establishing common standards in respiratory sleep training and education, in an adaptable framework which can be extended across Europe. HERMES was a project established in 2005 to provide documentation for the training and certification of adult respiratory specialists. Since 2005, the HERMES framework has been adapted for projects including paediatric respiratory medicine, critical care medicine and the development of the European Spirometry Driving Licence (spirometry). 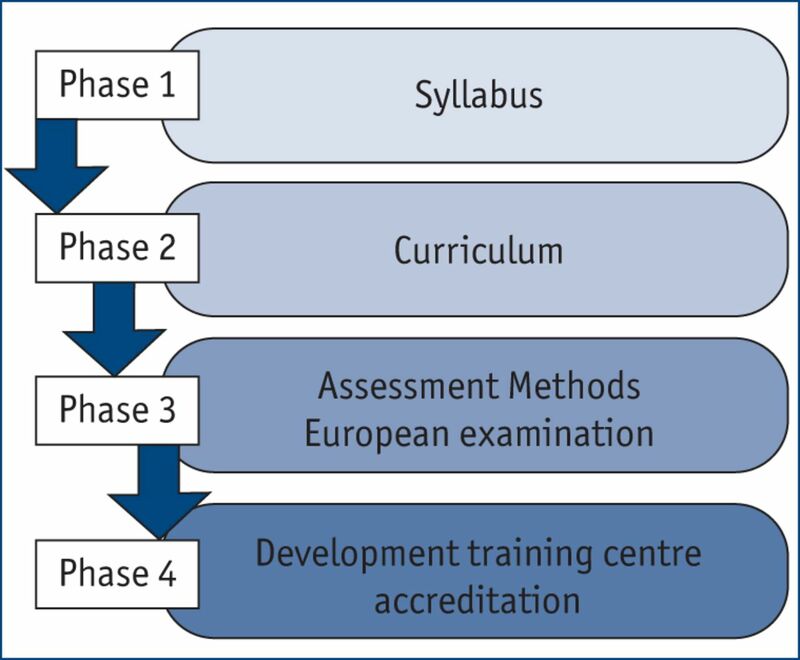 Within the HERMES model, a process of establishing consensus standards for training largely follows four key phases (fig. 1). In line with this developmental strategy, the Sleep HERMES Task Force will produce collective documentation and activities to support a syllabus, curriculum and European examination [7, 8]. The Task Force proposed development of a core syllabus in RSM as well as educational diagnostics and therapeutics guidelines (RSM curriculum) based on phase 1 (the syllabus). Four key phases of establishing consensus standards for training. The HERMES Sleep Task Force and project were officially launched during the ERS Annual Congress in Vienna, September 2009. The project is coordinated and funded by the ERS Educational Activities department. In April 2010, the Task Force drafted a list of topics mainly collected from educational material from courses organised by the ERS and other courses held in Antwerp and Edinburgh. The items on this list were reorganised to create a first draft of the “HERMES European Core Syllabus in Respiratory Disorders during sleep” in June 2010. This syllabus contained nine modules and 185 items focusing on the respiratory area of sleep disorders and aimed at targeting respiratory medicine specialists who would like to specialise in sleep respiratory medicine. In this publication, we describe the process of the RSM syllabus development and present its final version. In line with the methodology previously used to produce the adult and paediatric HERMES syllabi, the Sleep Task Force decided to use a modified Delphi technique to develop the syllabus [9, 10]. The Delphi technique has been shown to be a consensus development method of choice within the field of healthcare. It consists of an interactive process designed to lead to consensus within a panel of experts [11–13]. Several rounds of modified Delphi analysis using online surveys were performed to define a list of core skills and competencies any European practicing specialist in respiratory medicine should possess. The process involved three different groups. The Task Force consists of a Chair, two Co-chairs, and 12 experts in the field and represents altogether seven different European countries (table 1). This group consists not only of representatives from the ERS but also the European Sleep Respiratory Society (ESRS) and the European Board for Accreditation in Pneumology (EBAP). The Task Force identified the national respondents for the project through National Centres of Competence in Research across Europe. 21 national respondents participated to the syllabus development and contributed to the project, each representing one country (table 1). The third group consists of members from the Clinical Physiology and Integrative Biology Assembly (Assembly 4), Sleep and Control of Breathing Group. Altogether, 285 respondents originating from 35 different countries were contacted during the syllabus development process (table 1). The majority of the respondents who actually participated in the surveys were either respiratory medicine specialists in clinical practice or sleep medicine specialists in clinical practice (fig. 2). Breakdown of respondents to the surveys. Level 1/Basic: Awareness sufficient to recognise and know when to refer. Level 2/Intermediate: Knowledge sufficient to manage with consultation, under supervision or referral. Level 3/Advanced: Advanced knowledge sufficient for independent tertiary practice. Level 1/Basic: The item must be known by everybody involved in the respiratory sleep medicine field in daily practice. Level 3/Advanced: The topic need not be known by everyone in the RSM field. The item has the highest level of complexity and is highly specialised. A proposed syllabus, including these levels of competence, was evaluated in a third online survey for which respondents were able to agree with the Task Force proposal or to suggest further levels of competence for the syllabus items. The revision of the definitions and the last round of the survey led to the finalised syllabus presented in this publication (Appendix 1). In order to address the general positioning of RSM in the different European countries, the surveys contained questions on the current professional position and country of origin of the respondents. 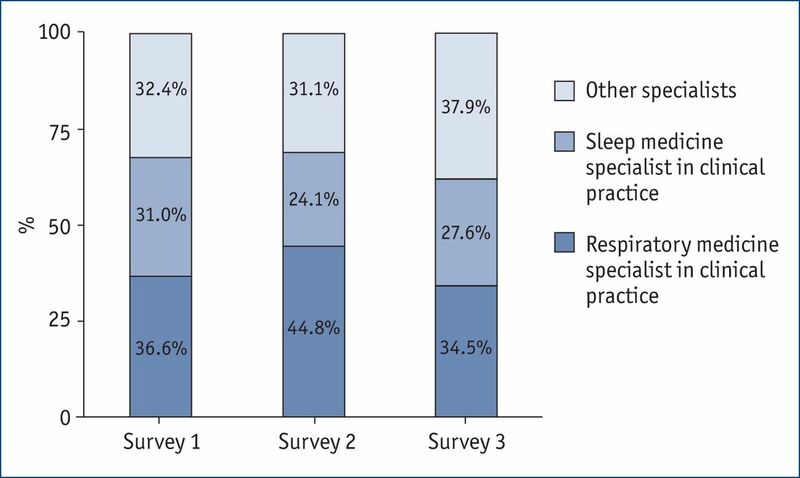 About two-thirds of the respondents were either respiratory medicine specialists in clinical practice or sleep medicine specialists in clinical practice, and one-third were other specialists (fig. 2). Several different countries across Europe and worldwide were represented throughout the three rounds of the surveys (table 2). The response rates were consistent in each survey round and varied between 19.4 and 31%, across all groups of respondents. The draft of the core syllabus in respiratory disorders during sleep contained nine sections and 185 items. The first survey was aimed at determining which sections should be included in the final syllabus and whether each item should be mandatory, optional or not included. In line with previous HERMES projects, it was initially proposed that the consensus would be reached when at least 80% of the respondents agreed on a question. Between 83.6 and 100% of the respondents agreed on having all the sections included, indicating a consensus on the proposed sections of the syllabus. Nevertheless, altogether the respondents reached a consensus on only 45.4% of mandatory items. In particular, no agreement was reached on any of the 45 items of the paediatric module and the opinion of the respondents was divided between “mandatory” and “optional” choices. These results were debated at the ERS Annual Congress in Barcelona September 2011 by the Task Force with the perspective of redrafting the syllabus. It was decided that the threshold for consensus would be 70% agreement instead of 80% and to recommend having the paediatric module as mandatory for paediatricians and optional for any other specialists. This revised document, reduced to eight modules and 172 items, was subjected to a second modified consensus-based survey to determine whether the paediatric module should be optional or mandatory and define the levels of competence of the syllabus. There was consensus to include the paediatric module as a mandatory module for paediatricians and as an optional module for other specialists. Discrepancies in the results on the levels of competence across the three groups were dramatic: the Task Force recommended mainly the basic level, the national respondents the intermediate level and the Assembly 4 members primarily recommended the advanced level. The Task Force members revised the definitions for the sake of clarification and harmonisation between the three groups and produced a proposal for the syllabus, including these levels of competence. The Task Force met in Prague to discuss the results of the last survey and update the syllabus. Their proposal was almost unanimously accepted by respondents and they were able to proceed to finalise the HERMES European Core Syllabus in Respiratory Disorders during sleep (Appendix 1). Sleep respiratory medicine remains a relatively young specialty within the respiratory medicine field. It is a transversal specialty, practiced by sleep respiratory specialists as well as pneumologists and paediatricians. Diversity in training is significant throughout the different countries in Europe. Certain countries do not have any specific training at all and most of them do not possess a syllabus. This situation validated the requirement for such a project to produce first a syllabus, then a curriculum and finally an examination, with the ambition of establishing European Gold Standards in training, education and certification for this specialty. Such outcomes would not only facilitate the mobility of specialists across Europe but also improve patient care. Any respiratory specialist who follows training with or without the paediatric module. The second option includes a mandatory paediatric module for the paediatricians. In both cases, this ensures that any specialist willing to be trained in paediatric RSM is expected to behave as a paediatrician. In conclusion, the results of the different steps involved in the syllabus development revealed that the initiative of establishing educational standards in the field of respiratory disorders during sleep has been welcomed by respondents within Europe. This project emphasises a real need and expectation not only for a syllabus, but also for a well-defined and structured framework for education, including an examination, to promote the harmonisation of training and practice. Throughout the different phases of this project, the Task Force aims at offering a complete set of guidelines for the RSM specialisation, including training and certification. Within the foundations of this project, the syllabus identifies the knowledge, diseases and procedures required to become a specialist in the field. However, such a document makes sense only in a holistic context relying on the success of the next project phases: the curriculum and examination. The Task Force is currently developing the curriculum to describe how the knowledge and skills of the syllabus should be taught and learned, with a view to having the inaugural examination in 2013. As the curriculum is mainly intended for trainers, the Task Force decided to produce some educational materials to aid future trainees. Thus, the Task Force has begun work on a RSM Handbook, describing the content of the curriculum. With such a handbook, the project will have reached its aims by producing each element required to harmonise the training and certification of the RSM specialty. A. Simonds has received research grants from ResMed for £303,000 and Breas Medical for £45,000. S. Andreas has received speaking fees from Heinen & Löwenstein and Respironics. W. Randerath receives scientific grants, talk fees and travel grants from companies that are working in the field of sleep medicine (Weinmann, Respironics, Linde and ResMed).
. Epidemiology of sleep apnoea/hypopnoea syndrome and sleep-disordered breathing. Eur Respir J 2009; 33: 907–914.
. Sleep apnoea: what are the challenges for tomorrow?. Breathe 2011; 7: 215–216.
. Ostructive sleep apnoea/hypopnoea syndrome. In Palange P, Simonds A , eds. ERS Handbook of Respiratory Medicine. 1st Edn Sheffield European Respiratory Society 2010; pp.404–409. , eds. Sleep Apnoea. European Respiratory Monograph 50. Sheffield, European Respiratory Society, 2010.
. Prevalence and impact of central sleep apnea in heart failure. Sleep Med Clin 2007; 2: 615–621.
. HERMES Spirometry: the European Spirometry Driving Licence. Breathe 2011; 7: 258–264.
. HERMES: a European Core Syllabus in Respiratory Medicine. Breathe 2006; 3: 59–69.
. A critical review of the Delphi technique as a research methodology for nursing. Int J Nurs Stud 2001; 38: 195–200.
. The Delphi technique: a critique. J Adv Nurs 1987; 12: 729–734.
. [What is the Delphi method? Strengths and shortcomings.]. Psychiatr Pol 2008; 42: 5–15.